Very rare and original, 1860's Civil War period Stereoview Photograph by Mathew Brady showing wounded Union Soldiers and a female Nurse (believed to be Abigail Hopper Gibbons) outside the field hospital set up in Fredericksburg, Virginia. This fascinating and original, flat mount stereo photo measures approx. 7" by 4" and is mounted on its original, orange colored card mount. There printed text on the front of the mount that identifies the View as being from the series titled "The War For the Union" and further printed text below the right hand Photograph identifies the title of the view as 740. There is further descriptive text on the reverse which reads This is one of the hospitals established by the Sanitary Com- mission, in Fredericksburg, Va. During the Wilderness Campaign, in 1864. The wounded are from Kearney's Division, and are being cared for by the noble Sanitary Commission. This Photograph was taken by one of the photographers working for Mathew Brady (possibly Timothy O'Sullivan) and was first published by E. Brady's negatives were obtained by John C. Taylor of Hartford, Connecticut who republished some of the views (including this one) in the years following the War and the Image offered here carries Taylor advertisement and mark on the reverse The War Photographic & Exhibition Co. This very rare and original, Civil War Stereoview Image features a truly fascinating view of a group of wounded Union Soldiers outside the entrance to one of the many hospitals set up in Fredericksburg after the Battle of the Wilderness. Most of the Soldiers here exhibit leg wounds and each has a pair of wooden crutches. An older female nurse sits in the doorway to the "hospital" holding a canteen - she is one of approx. 30 female relief workers came to Fredericksburg to help care for the wounded and it has been suggested that she is Abigail Hopper Gibbons. Abigail Gibbons was an active abolitionist, a conductor on the Underground Railroad, and an ardent supporter of the Union war effort. After the war began, she and her daughter Sarah Hopper Gibbons Emerson, recently widowed, volunteered as nurses. They spent fifteen months working at the military prison at Point Lookout, Maryland in 1862 and 1863. In May 1864 the two Gibbons women answered the call for volunteers at Fredericksburg. At age 62, Abigail Hopper Gibbons was probably the oldest female volunteer. Mother and daughter arrived on May 19, 1864, and would remain for a week. She wrote: Reached Fredericksburg at 2 P. Had dinner and I was put into a Hospital at once. The whole town is filled with wounded. House after house, store after store, filled with men lying on the floor. We see nothing but frightfully wounded men. 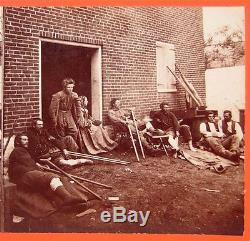 This fascinating and very rare, Civil War Stereoview Photo is in excellent to near mint condition. The Photographic Images exhibit sharp focus, strong contrast and rich, warm tonality. Both the Photographs and the Card Mount are clean and crisp and exceptionally well preserved. A very rare and wonderful, Civil War Stereoview Photograph of wounded Union Soldiers and their attending female nurse at Fredericksburg, Virginia and a fantastic addition to any collection! And Click Here to Add Us To Your Favorite Sellers List. Click Here to Discover More About this Item and Many Others on Our New Informational / Non-Commercial / Reference Blog - Walnutts. The item "1860's CIVIL WAR STEREOVIEW PHOTO OF WOUNDED UNION SOLDIERS & FEMALE NURSE" is in sale since Friday, June 12, 2015. This item is in the category "Collectibles\Militaria\Civil War (1861-65)\Original Period Items\Photographs". The seller is "walnutts" and is located in Brewster, Massachusetts. This item can be shipped worldwide.